If you are one of my 8 faithful readers, you may recall that I’ve mentioned Paul McCartney in a previous blog (“The Rock(y) Road to Country Music”) and alluded to my devotion to the Beatles, especially Paul. Let me say right now that I know this was (is) a shallow crush, based on physical attributes. In my defense, I offer this argument: What baby boomer woman of a certain age doesn’t have the Beatles in the soundtrack of her life? It started when I was eleven watching the Beatles on “The Ed Sullivan Show”—standing in front of a black and white television in the basement of my parents’ home. The rest of the family was upstairs watching on the newer TV. I was alone because I was in trouble (nothing new) and because I didn’t want those people spoiling it for me. I was still in my St. Bernadette’s uniform—blue jumper and white short sleeved blouse with a Peter Pan collar. (It wasn’t a good look for anyone.) The first time the camera zoomed in on the regular features of the cutest Beatle, I was a goner. Throughout my life (so far) I have been drawn to the Irish-Anglo look, brown hair, and a face that shows warmth and self-deprecating humor. Not having dated Paul, I can’t attest to his sense of humor, but my first real boyfriend had a great sense of humor and his first name was James, which is Paul’s first name. Bet you didn’t know that. Anyway, my Jimi (yes, that’s how he spelled it) was also a brown-haired charmer, who thoroughly broke my heart when I was 15. In 1965 I saw Paul, and the other three, in person when the Beatles performed at D.C. Stadium. In those days, I could name (and sing) every Beatles’ song in three chords. I had the order of the songs on the albums memorized because I had played them so often on my pink and white record player. Seeing the Beatles, even from a distance as was inevitable in a stadium, was so thrilling that I can’t remember it. I mean that the experience was so huge I was just in the middle of it and had no room for storing memories. So while I can’t recall specific moments, I’ll never forget the feeling. I was twelve then and no other concert has ever surpassed the sheer thrill of that one. I wonder sometimes if our iPhones have pushed us back from experiences. I mean it takes you away from the moment to take a picture, tweet a comment, or post your status. You lose the connection and immediacy or at least I do. Over 50 years ago I watched those tiny gods of music on an unadorned wooden stage without big screens or pyrotechnics and listened to probably marginal amplification. But I was there, present, completely overtaken by the sound, the sight, and the wonder. I’ll never forget it. For a few years, I flirted with devoting my personal Beatlemania to John, the smart and tortured (but not as tortured as George) Beatle. My cousin Sandy and I would cut out and save pictures of our favorite Beatles from teen magazines. She would give me the Johns and I would give her the Ringos. But at home, I had a secret stash of every adorable expression that crossed Paul’s face. Before this gets sickening let me mention that I had a real life, too. I went to college, got married, had a career, got married, had a son, got married. But I always kept my eye on Paul. I liked his post-Beatle music, his nearly 30 year marriage to Linda, his devotion to his children, and his obvious grief at Linda’s passing. He and I lost our spouses in the 90’s—that was a bond. I like that Paul was and is the marrying kind. I especially like that Paul usually marries women who are friends and in an acceptable age group (no twenty year olds, thank you very much). Flash forward to 2005, when my husband and I saw Paul perform in Sacramento. It was an amazing concert, just as the concert on October 8th was amazing (more on that in the next blog). At one point I took my eyes off the stage and looked at Mike, my self-deprecating and generous husband, with his Irish-Scottish DNA, brown hair (no mullet, thank God), and sometimes brown and sometimes hazel eyes. Yes, the resemblance is definitely there. I’ve come full circle. There’s a big difference between being 18 and being 60-something. And that difference became abundantly clear the first day of the concerts. The friends who traveled with us in their motor home (let’s call them Randy and Sue) had the campsite next to us in the lovely Emerald Desert RV Park. Sue and I decided to walk a couple of miles in the morning and then exercise in the pool for about 40 minutes. Big mistake. Our husbands hung around the sites and arranged to have the vehicles washed and waxed. All of this was before we knew what lay ahead. Turns out that the shuttle (a full size bus that played the same music during every trip) let us off at the edge of the polo fields—a mile and a half from our seats. 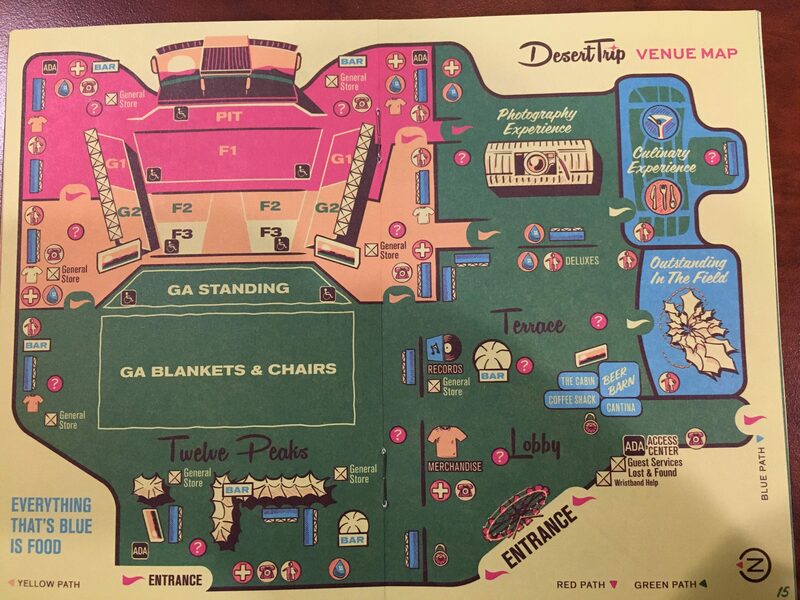 (The concerts were held at the Empire Polo Club in Indio, CA—the second largest in the country.) This amble across a long field, down a dirt road and next to endless parking happened in blazing heat (over 95 every day) We could have gone later as the concerts didn’t start before 6:30. 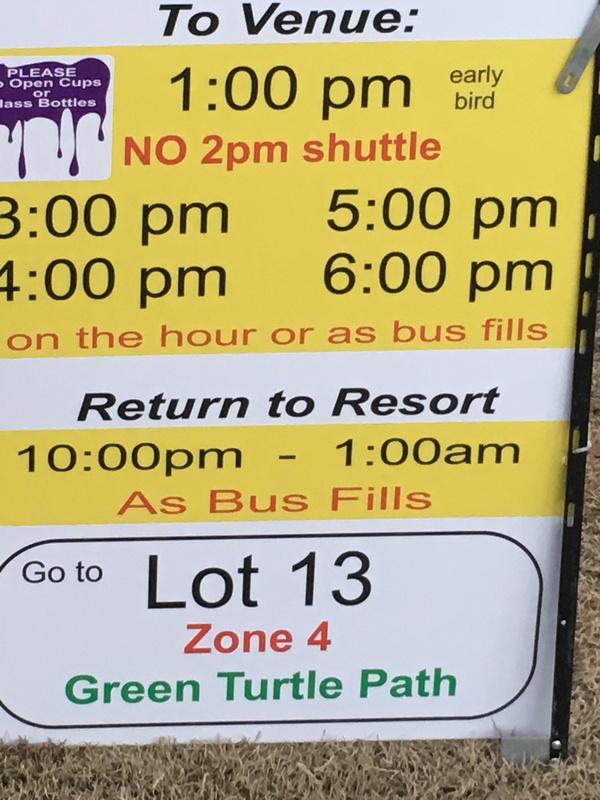 However, Sue wanted to get there before 4:00 and managed, using a variety of techniques such as horror stories from other campers who left on a later bus, to beat us into submission. So we arrived every day in the apex of the heat to find that all the couches and most of the shade had been grabbed up by people even crazier than we are. Still there were many amenities designed to please everyone but especially the baby boomers. These included air-conditioned restrooms with private cubicles and flush toilets, many, many food choices including a culinary experience complete with servers, gourmet food and a big price tag (a mere $179 per day and a bargain at $499 for all 3 days), an air-conditioned craft beer lounge and a shaded dome tent complete with wine for the connoisseur (or snob)—Silverado Cabernet Sauvignon, a mere $29 a glass. The first day the volunteers were a little lax and you could wander around the whole venue; that gave us an opportunity to see just how far our seats were from the stage. I hate to admit how much we paid for this once-in-a-lifetime experience in Section F-2, but it was a lot and it was worth it, even if the performers could only be seen through binoculars. There were huge jumbotrons so we had a good view of what was happening on stage…most of the time. The first act was Bob Dylan. I have to admit I’m not a huge fan of Dylan’s voice and I was subjected to it frequently in my early years by my older brother who thought Dylan was a genius. I guess the Nobel Prize Committee agreed since they awarded him the prize for literature a few days after this concert. During his first five songs, Dylan was projected onto one of the three screens behind the stage. The other screens showed powerful and mainly depressing black and white photography. After those songs, all the screens showed photos—the same photos we had already seen. Several times. Dylan didn’t greet the audience, comment on the venue or say good-bye. Basically he acted like he was alone and playing for himself, which I understand from his more rabid fans is his modus operandi and anybody who expects something different is naïve, uninformed, and basically unworthy. The three Californians I was traveling with could not get over Dylan’s disinterest in his audience. “I can’t believe he didn’t even say hello.” I heard this several times. Maybe it’s because I grew up on the East Coast but I didn’t care about that or that we didn’t get to see him after 5 songs. What I objected to was his singing. While he is a brilliant lyricist/poet who has vividly chronicled the American experience for more than 50 years, his voice is shot. And I have to admit I felt vindicated when music reviewers basically said the same thing. I could tell he was winding down (e.g., hitting even fewer notes) so I took myself off to the bathroom and the closest bar and when I returned it was time for the next act. The opening chords of “Start Me Up” signaled the frenetic pace that carried the Rolling Stones through 2 hours of serious rock up to midnight. Mick Jagger was indefatigable; he’s as thin as ever (think Twiggy but skinnier) and his face belongs on Mt. Rushmore. I’m talking craggy. Mick went through at least 7 changes of clothing (mostly jackets) that I think happened during guitar and drum solos. In my untutored opinion, these guys are still making great music. And they know how to talk to a crowd. The end came with fireworks and “Satisfaction” lighting up the audience and the sky (literally). The energy surging through us kept us high (on music) and rocking all the way back to the shuttle bus. It also kept me awake for quite a while after our return to camp at 1:30. All of this would’ve been irrelevant had not the waxing and buffing of our fifth wheel started at 7:15. In the morning. After 3-4 hours of sleep. At my age. Also Sue’s Fitbit indicated we had walked 6 miles, not counting our insane exercising in the morning. Still the next day would bring my favorite musicians Neil Young and Sir Paul. 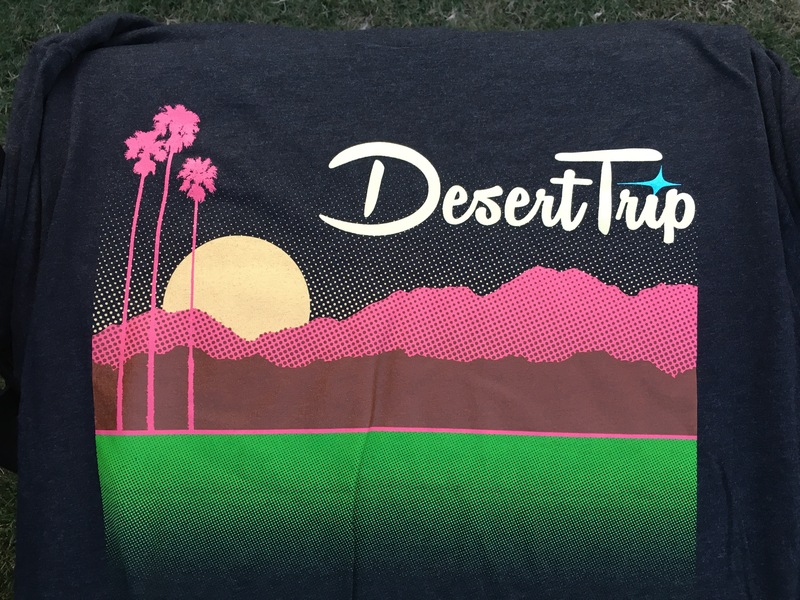 Most, if not all, of the articles I’ve read about the first weekend of the Desert Trip share a preoccupation with nostalgia and a snarky need to mention everyone’s age. I think the 70,000 people who showed up for three nights know how old they are and whether they were around 50+ years ago when Mick and Paul started redefining music. And some of us actually got to see them way back when. I saw the Beatles during their second and last American tour (1965) and the Rolling Stones when I was in college (sometime in 1975 or 1976–it’s a blur). One article made the point that the music of the 1960’s and 70’s is really current music because young people are listening to it today. Uh, no. It’s our music and by that I mean the music of the people known as the baby boomers. And the reason our music is still around is because it’s better than anything that followed. And we have the hearing loss to prove it. I read today that media is calling the Desert Trip “Oldchella.” Well here’s a message for you, young media know-it-all: you’re going to be older one day, with physical and maybe mental challenges, and that’s if you’re lucky. BTW, ICYMI, we’re the generation that made “F” an all-purpose word. One could say that your f’ing attitude shows how f’ed you are; you’re kind of an f”er. (adjective, adverb, noun). So verb you, Buddy. LOL. 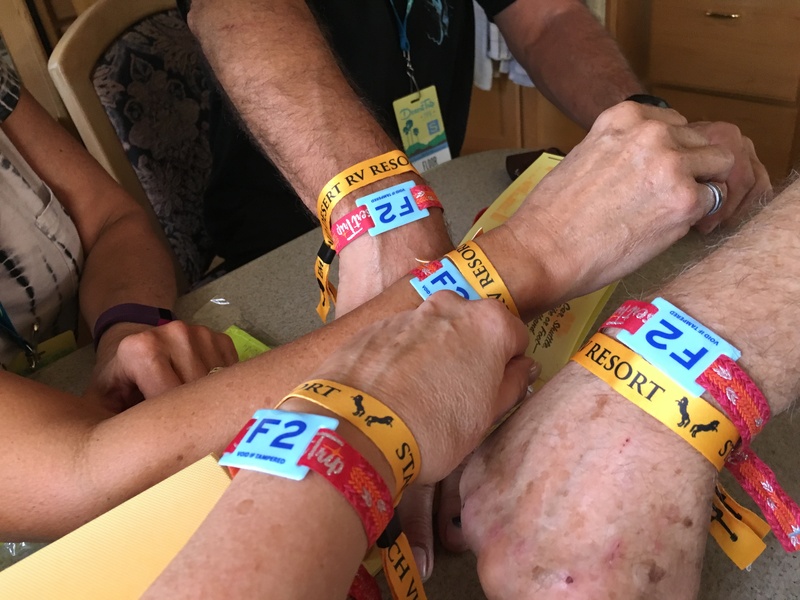 Next blog–the first night, the heat, the merchandise, the food, glamping….